Schaerbeek’s uptown neighbourhoods, close to the Pentagon, are favoured by EU employees and Brussels’ more affluent residents. 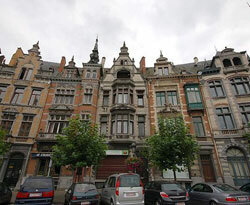 This area of Schaerbeek is quiet and elegant. On the whole, property prices are still reasonable, though they are going up. Many houses are in the Art Deco and Art Nouveau styles. Others are Baroque, with carved stone facades, ironwork and heavy doors. Some newer houses are smaller pied-à-terres. Neo-Gothic buildings such as the St. Augustine Institute and the weathered St. Servais Church add to this mix of architectural styles. St. Servais Church is at one end of Schaerbeek’s main road, Avenue Louis Bertrand. The avenue borders the Parc Josaphat, six hectares of greenery with walking trails, ponds, thickets of old trees, tennis courts, and a small golf course. Marble statues dot the park and a small stream winds its way through it. Its source is the Minneborre, or Love Fountain, so named because according to legend there was a man who, after becoming blind after crying about his unfaithful lover, regained his sight after he bathed his eyes in the fountain. There are residential buildings within the Parc Josaphat. Downtown Schaerbeek is a different story. The social housing of the Cité des Oliviers on Rue de l'Olivier contrasts starkly with the uptown neighbourhoods. The downtown area has substantial Turkish and Moroccan communities, and is much more active and densely populated. Building a railway through the town in the 19th century transformed Schaerbeek from a quiet village into an urban centre. The large, neo-Renaissance railway station remains one of Schaerbeek's more distinctive edifices, even though it now only serves a few regional routes and is no longer the important stop it once was. Schaerbeek is a community of museums, from the informal ones—the park with its statues, the town hall with its Renaissance design—to actual ones such as the Maison des Arts, the Clockarium, which is an Art Deco clock museum, and the Museum of Beer. The community is undergoing urban renewal, especially in the more run-down areas. New homes and apartment buildings are planned.